These grooved metal, Kammprofiletype gaskets comprise a metal core with concentric grooves on either side, and usually a soft layer of sealing material bonded to both grooved faces. Flanges of high temperature/pressure pipework and vessels where operating conditions can fluctuate; also heat exchangers. • Accommodate a vast range of operating conditions. • Line temperatures and pressures up to 1000°C or 250bar. • Undamaged cores can often be fitted with new soft faces to reduce maintenance costs. • *Metakamm Easi-Fit (EF type) gaskets come with two or four locating lugs to aid fitting. • **Metakamm Multifit gasket fits Class 150 to 2500 flanges. Aluminium and silver also available. Available in stainless steels 304, 304L, 316, 316L, 316Ti, 321 and 347; Monel 400 and K500; nickel 200; Inconel 600, 625 and X750; Incoloy 800 and 825; titanium; Hastelloy HB2 and C276; copper. Standard diameters from 10mm NB up to 3600mm NB. Standard thicknesses: 3.0mm and 4.0mm cores with 0.5mm soft facings either side. Non-standard thicknesses: from 2.0mm core upwards. As six designs to suit different flange faces. Almost any combination of component materials is available. 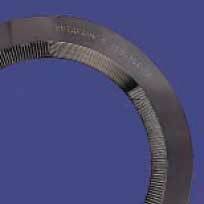 Special profiles include oval, rectangular and heat exchanger shapes with pass bars.